The nineteenth century saw a profusion of shopping passages, offering welcome respite from the dirt, traffic and chaos of the city. Paris had an extensive network, many of which survive; London had fewer, but it's hard to beat the grandeur of examples such as the Burlington Arcade. While these mainly dated from the late eighteenth and early nineteenth centuries, other cities built theirs later in the Victorian period. 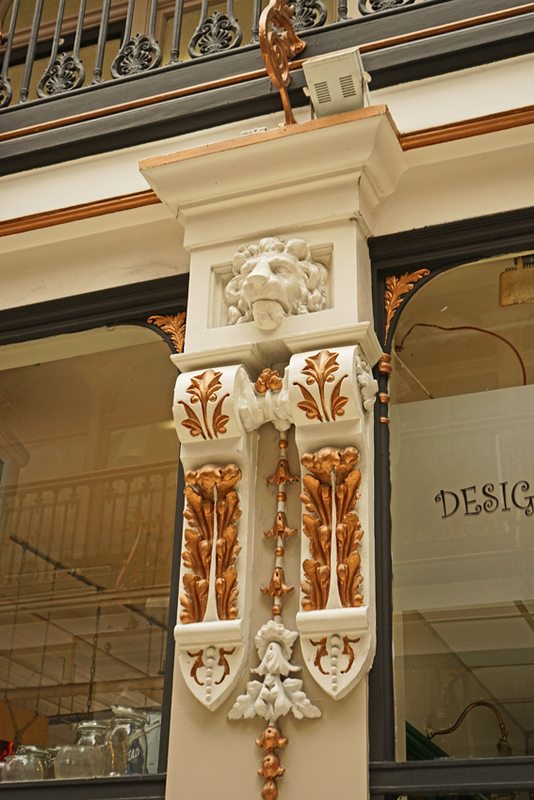 Manchester has a beautiful example from 1871: the Barton Arcade on Deansgate. 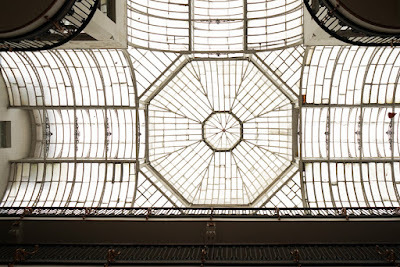 A slightly cramped entrance between buildings hardly prepares the visitor for the light, soaring construction of iron and glass revealed inside. 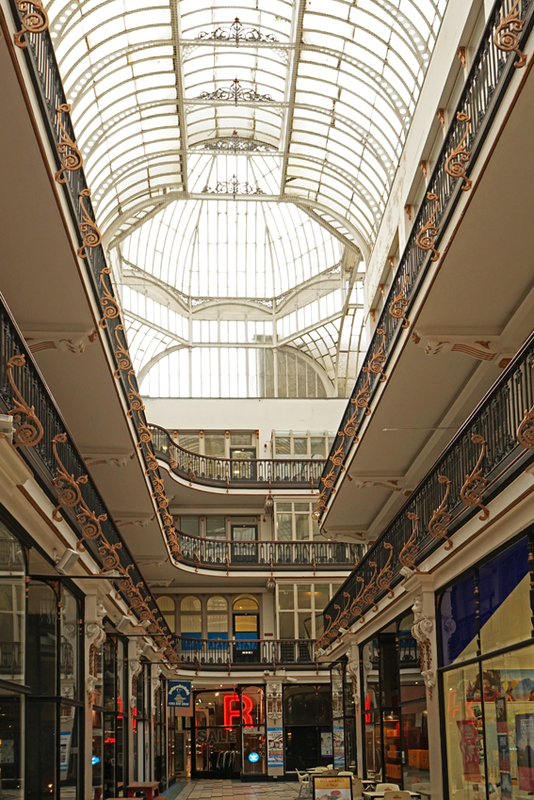 In Pevsner's guide to Manchester, Clare Hartwell describes it as 'one of the loveliest Victorian shopping arcades in the country'. 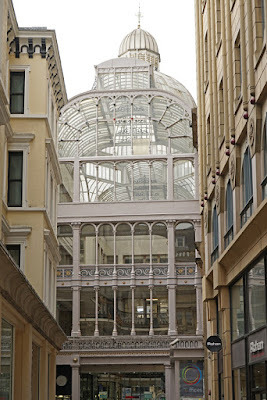 The arcades of London and Paris are clearly constrained by their sites, narrow and sometimes dog-legged; by contrast, the Barton Arcade feels relatively spacious. This is partly thanks to its soaring roof, but also reflects a change in inspiration and purpose. While the earlier arcades originally aspired to fashionable exclusivity, the Barton Arcade is acknowledged to have taken its inspiration from the Galleria Vittorio Emmanuele II in Milan, much larger and closer to today's shopping centres. 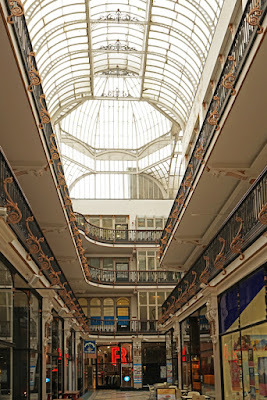 Although it wasn't fully completed when Barton Arcade was being built, it had already been featured in The Builder - an honour its smaller Manchester counterpart would later share. This was also a rather different situation to the in-filling of cramped sites in the city. Deansgate had recently been widened, and many of the buildings originally lining the street demolished; the Barton Buildings were among the first new constructions. Their name is that of the developer, John Hope Barton, a local property owner whose arcade cost him £45,000 to build. The generous payment he received for buildings demolished in the road-widening scheme, as well as the grant of this site in compensation, no doubt helped with the cost! 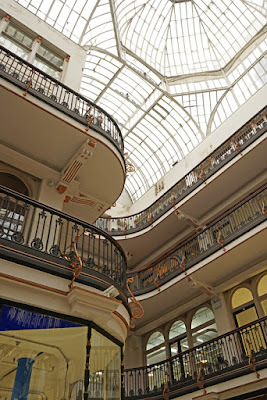 The Arcade was restored in the 1980s, so the shop fronts and floor are not original. 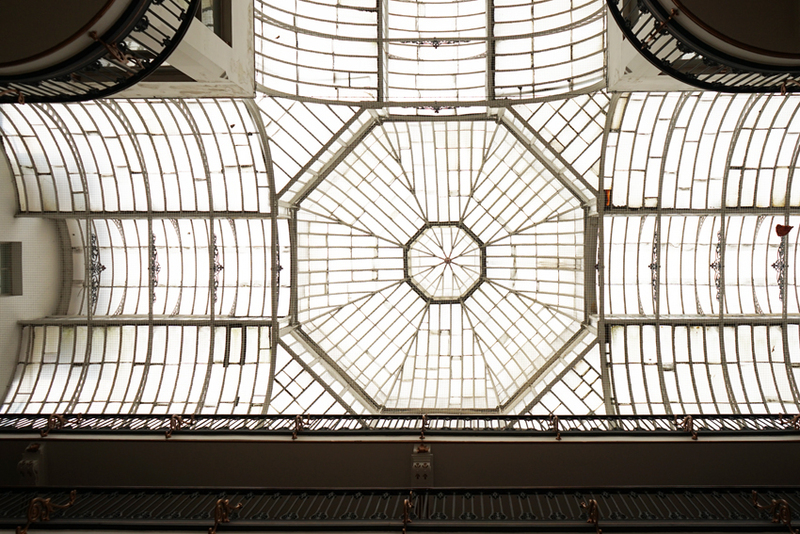 However, the sweep of curving balconies built by Corbett, Raby & Sawyer is intact, and the fabulous ironwork from Macfarlane's foundry creates a roof which is as breathtaking as when first built. Wonderful. The Silver Arcade in Leicester is smaller but is attractive, unfortunately too many of the shop units are standing empty since it was refurbished a few years ago. It used to be a quirky mix of unusual and interesting shops even if the arcade was a bit shabby. They have been priced out of the Arcade. That's such a shame. One would think that low rental income is better than no rental income. Not to mention that filling an arcade with high-paying chain stores does nothing for its atmosphere.